FARMS4Biodiversity is an ambitious, interdisciplinary, multi-scalar project designed to address biodiversity conservation, support ecosystem services and improve food security under scenarios of land-use change in the Global South. As a low-income country with a largely agrarian population, Malawi mirrors many other socio-ecological systems in Africa in that multi-scalar processes drive high food insecurity, deforestation, soil degradation, and urbanization. Input-intensive agricultural interventions have not delivered anticipated outcomes for smallholder farmers. Reliance on synthetic pesticides threaten biodiversity, and land use change including deforestation, forest degradation, and cropland expansion convert heterogenous mosaics to a more homogeneous land cover. Although a growing body of research suggests that agroecological practices may buffer a farm against biodiversity loss resulting from land use change, little of this research explores the link between biodiversity and ecosystem services such as crop productivity. Furthermore, it is unknown whether local-level practices have landscape-level benefits when large numbers of farmers in an area adopt such practices; there may be breakpoints below which the landscape cannot support high levels of biodiversity or ecosystem services. 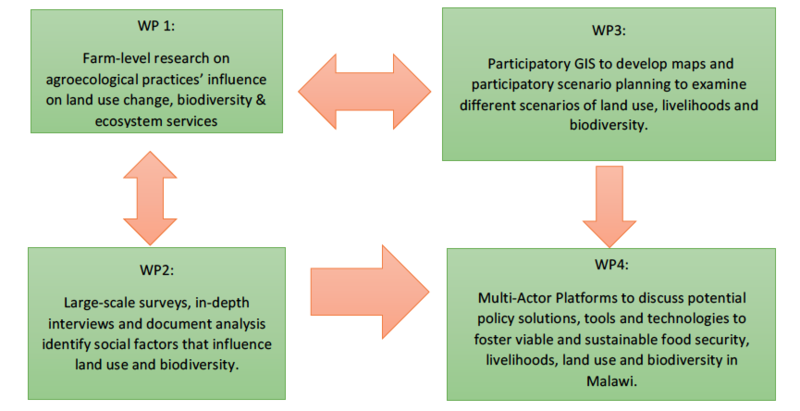 We propose an innovative participatory, transdisciplinary methodology that will bridge the science-practice gap, using farmer participatory research on ecological surveys, socio-economic surveys, scenario models and participatory scenario planning. Q1: Can agroecological practices at multiple spatial scales buffer against the loss of biodiversity and ecosystem services under current and future land use scenarios in Malawi? Q2: Are there breakpoints of landscape-level agroecological adoption above which biodiversity and ecosystem services are maximally retained? Q3: Do social roles (e.g. class, gender, health status) and/or key macro social forces (e.g. agricultural policies, extension services, international agreements) influence agroecological use and related measures of household and community resilience under low-income smallholder farmer conditions in Malawi? Q4: Can participatory scenario planning enhance long-term community resilience and biodiversity under different land use scenarios and anticipated climate change impacts? Q5: Do new institutional and policy frameworks enable the use of agroecological practices to reduce biodiversity loss, sustain ecosystem services and improve climate change adaptation? This study involves a longitudinal, case-control and participatory research design. To address our research questions, we will survey 1,000 farm households in Mzimba District, where we have worked with farming communities for over 5 years. From these households, we will select 50 farms from 25 villages from which we will collect detailed socio-ecological data. Half of these selected farms will have participated in a previous project that promoted agroecological practices, whereas the remaining half will not have participated in this project. This paired design allows us to compare the impact that agroecological practices have on biodiversity and ecosystem services, while the inclusion of multiple villages across the region allows us to assess how these impacts may be affected by different land use scenarios. The proposal consists of four work packages; click on one to learn more.